Mariapfarr is a village in the Lungau area of Salzburg. It can be found in the south-eastern outskirts of the province and has a total population of approximately 2,300. In the Slavonically influenced local dialect, Mariapfarr is called "Pforch", which sounds a bit like a cat coughing out a fur ball. Measured in hours of sunshine per year, Mariapfarr is the sunniest community in all of Austria - and has been so for many years. 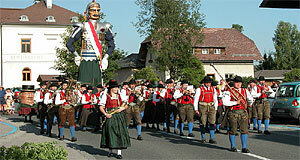 The name Mariapfarr means "Mary′s Parish" and refers to the fact that it is the spiritual centre of the Lungau. The parish church of Mariapfarr is a church of pilgrimage that was first mentioned in a written document in 923. In this document, it was referred to as the "ecclisia ad lungovue". Today, visitors can learn more about Mariapfarr′s past as religious centre in the "Pfarr- und Pilgermuseum" of the village (Parish and Pilgrimage Museum). In addition to the church and the general appeal of Mariapfarr, this is the community′s main attraction. There is a second noteworthy church (or chapel) in Althofen. Like many communities in the Lungau, Mariapfarr is known for gentle summer tourism. The winter season happens elsewhere, but during the summer, many locals go to this area for hiking. Typical customs and traditions of the Lungau are still being practiced as part of every day life in Mariapfarr. Don′t expect an anthropological experience with primitive natives, Austria is a developed country and even remote valleys are highly advanced. However, ancient traditions such as the Samsonumzug have survived as part of genuine local culture - to some extent also for attracting tourists. Mariapfarr is one of the communities that still do Samson parades.